Digital isn't a thing, it's everything. Buzzwords and complex acronyms are being thrown around, but no-one is really aware of what change means. Business leaders are feeling the heat to quickly adopt new technology and new digital concepts. No business wants to be left behind, and as a result many rush to embrace the latest trends before their business is quite prepared for it. Tom Goodwin cuts through all the unnecessary complexity and helps marketers understand the future before they start preparing for it. Tom Goodwin's Digital Darwinism uses case studies and smart illustrative examples to communicate how to survive the new digital climate before it bowls us all over. Tom Goodwin is the quintessential digital disrupter and in this episode of Marketing & Tech Book Club, we got Tom to dish on what excites (and frustrates) him about the industry. 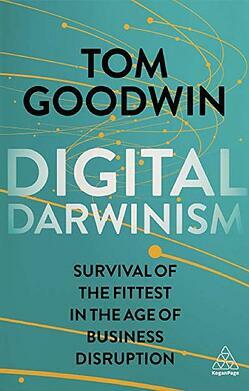 Tom himself has admitted that his book, Digital Darwinism, was borne out of a fair amount of anger and frustration. While he acknowledges that not every company is "screwed" by technology or needs to change, he wants less caution and more excitement towards what it can offer. "There are a lot of companies that need to get excited about technology. They need to embrace it and think of it in a much more profound and existential way"
I wish every annual review included questions like. In what ways have you lead change? What's your biggest screw up? How have you helped others' grow? What assumptions do you no longer make? What outside the industry have you brought in?